Below is the list of submissions that I've received and responded to. As previously written, if you have any issues or there are any mistakes, please contact me at derringers2018@untreedreads.com and do NOT post to [Shortmystery]. Here's the complete list of Derringer submissions that I've received and acknowledged through 1/20. I apologize for those who submitted at the beginning of January but only received acknowledgments tonight. Technology is a beautiful thing... when it works. Many thanks to those of you who made donations [to Cancer Research Institute] in Sandi [Tipple] and Bill [Crider]'s name! It has been awhile, but SMFS member Peter DiChellis is back today with some thoughts about ransom notes in this technological age…..
Mystery writers scrutinize every angle of all types of dastardly crimes to research their stories. And after giving it a little thought (some might say too little), I’ve decided composing the ransom note would be the toughest part of a kidnapping. Think about this from the average kidnapper's perspective: You create ransom notes like those by cutting up magazines and pasting different letters together. I suppose this prevents linking your handwriting or printer to the crime, but who has magazines lying around the house any more? So now you’ve got to make a special trip to a newsstand? And then what? You flip through every magazine in the place to see which ones have the letters you need? Seriously? Okay, let’s say you’ve already got scissors at home and a sheet of paper to glue the letters onto. You still have to flip through the magazines again, cut out the letters you need, and glue them onto the paper. Sound easy? No way! First off, there’s no spell-check or auto-correct, so you’re on your own to get the spelling right. And what if some of the letters are so big there’s not enough room when you get to the end of a line? Now you’ve got to dig through the magazines again to find a hyphen? And don’t get me started on other punctuation! What if you need a semi-colon or an accent aigu? What kind of magazines do you buy to find those? Also, if you’ve got any taste at all you have to consider how different letters’ fonts and colors will look together. Otherwise, the note becomes a disjointed eyesore and an FBI profiler will construct a really embarrassing evaluation of you: “The unsub is probably a sloppy, colorblind loser who has an unhealthy obsession with grammar and composition, knows nothing about desktop publishing, hangs around in newsstands, and has fingers covered with glue residue.” Not exactly flattering. Sure, the movies want you to think picking up the ransom money is the toughest part of a kidnapping because the cops can stake out the pick-up spot. But think about this: The people who make movies have assistants who can put together the ransom notes for them. Ordinary kidnappers need to do it themselves. Finally, I’m happy to announce two new stories. My double-twist crime story “Eternal Love” starts with a ransom note and ends with a tragedy. 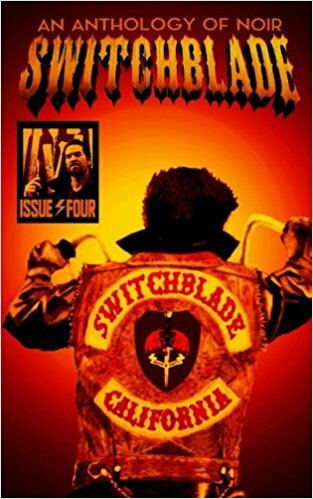 The story appears in LA-based noir standout Switchblade: Issue 4, available at discerning Los Angeles-area bookstores and on Amazon too. And my humorous mystery yarn “Listen Up” is the cover story and free to read in the new issue of Derringer rockin’ online ‘zine Flash Bang Mysteries. The full archive of over 130 essays published by Bonnie as well as her daughter after her mom passed can be found here. The full and growing archive since Art Taylor took over back in November 2017 can be found here. 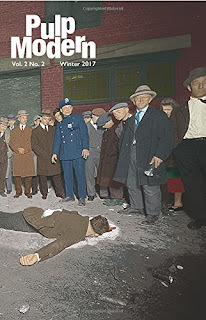 SMFS Member Robert Peyto's short story, "Sacrifice" appears in Pulp Modern: Volume 2, Issue 2. The issue was released in December 2017 and is available in both print and electronic versions at Amazon and elsewhere. On January 3, 2018, Derringer Awards Coordinator Jay Hartman posted to Shortmystery a suggestion that those submitting for the Derringer Awards also consider a donation to cancer research as a way the SMFS can give back to our communities. In the same Shortmystery post, Jay set boundaries for onlist discussion of the current Derringer process. ...There is never a fee for entering the Derringers. However, I think that this year the Derringer Awards should have a giving-back element to them due to several crises that members have experienced. I would ask that if you are submitting an entry for consideration you make a donation to the Cancer Research Institute in the name of Sandi Tipple or Bill Crider. CRI is considered one of the top three cancer charities, where roughly 85% of all donations go directly to programs. Making or not making a donation will in no way affect your chances of receiving an award and is not a requirement for submission. This is about doing good. However, if you do submit proof of a donation with your entry, Untreed Reads will send you a coupon code for a free ebook of your choice from http://store.untreedreads.com as a thank-you for making the world a bit better and for honoring two people who mean/meant a lot to all of us. 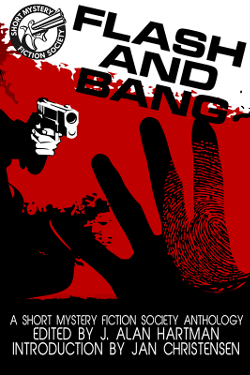 Total dollar amount raised will also be announced at the presentation of the Derringer Awards in September at Bouchercon. ...Long, protracted arguments and battles about the Derringers will not be engaged or entertained and there will be no tolerance of public mistreatment of individuals for differing opinions...I simply won’t allow either myself as Derringer Coordinator or authors to be attacked in any way. Personal and/or public attacks on others may result in disqualification. Keep it civil! Looking forward to a great Derringer season with everyone! Since 1998, the Short Mystery Fiction Society has awarded the annual Derringers—after the popular pocket pistol—to outstanding published stories and people who've greatly advanced or supported the form. As of 2004, an annually-elected Derringer Coordinator administers the regular Derringer process. Detailed below, the process runs January 1–April 30, recognizing stories published the previous year. As of 2009, a committee of the sitting SMFS Officers, Derringer Coordinator, and two regular members selects a living writer whose outstanding body of short fiction merits the Society's Edward D. Hoch Memorial Golden Derringer for Lifetime Achievement. 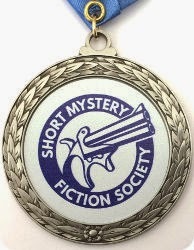 In addition to the May 1 winners announcement, as of 2009, winners also receive physical medals at a presentation during Bouchercon, the World Mystery Convention. To donate toward the medals, contact Vice President Larry W. Chavis. Editors of venues featuring mystery or crime short stories can submit eligible stories published in those venues. g) with the story's appearance decided by the venue's editor(s), not the author (i.e. neither self-published nor submitted to a non-edited venue). 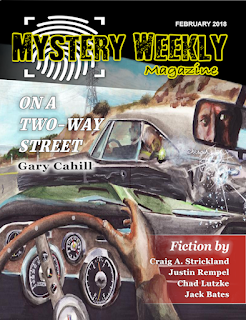 Shortmystery members who joined by December 31, 2018 are allowed to submit up to 2 eligible stories. 6 editorial submissions are allowed from venues featuring more than 75 stories. For multi-editor venues, the editors split the number of submissions determined above. 6 editorial submissions are allowed if they edited a total of more than 75 stories. The number of submissions allowed from any one venue remains bound by the venue's total eligible stories. 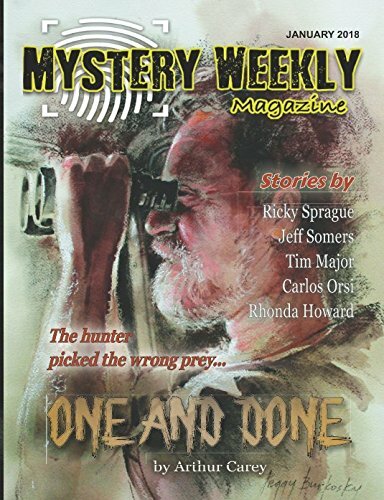 Editors who are also Shortmystery members, in addition to their editorial submissions, may submit two eligible stories from venues other than their own. An editor may decide not to submit his/her venue's stories. S/he cannot prevent other Shortmystery members from submitting them UNLESS s/he acquired such controlling rights over the stories. To make the judges' jobs as easy as possible, and to prevent having to reformat an assortment of submission layouts, there has to be a standardized format for submissions. The 2019 Derringer competition uses William Shunn's more-or-less industry-standard layout linked to below, except that (a. ), the manuscript should use 12-point Times New Roman font, and (b. ), the personal contact information normally included at top left of page 1 may be omitted. Please remove all of your personal information from the ms. Any personal information found will be stripped from the ms before it is placed into judges' packages. This is to encourage open-minded judging. When submitting your stories, please include "[Derringers]" somewhere in the subject line. This will make it easy to spot your submission so that nothing is lost. the URL to the published story if applicable. Email prepared submissions to tony.rudzki@gmail.com. Anyone submitting someone else's work must have and is presumed to have acquired the proper permissions from the author. By submitting someone else's work, a submitter assumes responsibility for having the proper permissions. The Coordinator posts updates of the stories received throughout the January submission period. This avoids duplicate submissions and serves to check that stories submitted are received. If any story submitted does not appear in an update and you have met the listed eligibility requirements, follow up with the Coordinator. All submissions must be in by January 30, 2019. January 31 will be used to prep submissions to be sent to the judges. 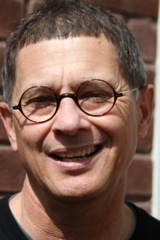 Please direct any questions or issues to Anthony Rudzki at tony.rudzki@gmail.com. Each category requires three primary and one alternate SMFS members to judge the category down to five finalists. To protect their identities and the privacy of the judging process, members sign up to judge by contacting the Coordinator directly by January 31, 2019. Volunteers can specify which category they wish to judge, subject to availability, but they cannot judge categories including stories they wrote or published as editor. The Coordinator keeps this in mind when assigning judges, but any erroneously-assigned judges should inform the Coordinator, who decides how to rectify the error. Before sending the Derringer submissions to the judges, the Coordinator ensures the manuscripts show neither the author's name nor the details of publication. This is not to mandate blind judging, but to encourage open-minded judging. Judges may recognize authors and publication details but are nevertheless expected to score all stories in their rightfully assigned categories regardless. The Scoring Guidelines below have been used for over a decade as a way of encouraging a measure of commonality among different judges' approaches. They are not litmus tests to be applied in a cookie-cutter manner by all judges to all submissions, but are rather a source for general areas of consideration that can be used to the extent considered appropriate in conjunction with a judge's individual experience, acumen, and skills. A judge assigns each of these areas a score of 1 to 10. The judge should note these individual scores but need not formally record them. The judge then adds the four individual areas' scores together to arrive at a cumulative score of 4 - 40. For each submission, each judge in the category reports this single, cumulative score on the scoring sheet provided by the Derringer Coordinator. If, at any point during the reading of any entry, a judge concludes that the impression formed thus far is final and without reasonable expectation of change regardless of what remains to be read and evaluated, the judge is not bound to continue reading that entry. How well does the writing grab and hold your attention? Do the prose style and dialogue serve the story well? Does the story's setting or overall atmosphere draw you in? Does the story rise above others in the category for the way it's written? Are they well developed and convincing? Is there good interaction between characters? How well does the writer handle viewpoints or inhabit each character? Do the characters serve the story well? How well are the story events structured from beginning to end? Does the story rise above others in the category for its plot? Does the story set up and then meet or cleverly subvert expectations? Did you have a good reaction to the story not described by the other elements? How memorable was the story? The alternate judge in a category is called if one of the primary judges is unable to serve to completion for some reason. The alternate will be asked to read and evaluate only the portion of the category's entries that the primary judge was unable to get to. All stories must be scored and returned to the Coordinator by March 30. March 31 is reserved for the Coordinator to verify the outcome of scoring. For each Derringer category, the five stories with the highest averages become the Finalists. On April 1, the Coordinator announces the Finalists on Shortmystery and announces them publicly here on the blog. On April 1, the Coordinator uploads the finalist manuscripts to Shortmystery's Files section and opens voting in its Polls section. All members as of December 31, 2018 are eligible to vote. No new memberships are approved during the Derringer process (January 1–May 1). Here is a voting example. April 30 is reserved for the Coordinator to verify the poll results and prepare the announcement of winners. The Coordinator then deletes the manuscripts from Shortmystery's Files section. On May 1, the Coordinator announces the Winners on Shortmystery and announces them publicly here on the blog. Winners will be presented with Derringer medals during Bouchercon 2019 opening ceremonies Thursday, October 31 at the Hyatt Regency Dallas, Texas. Any unable to attend will receive their medals by mail. 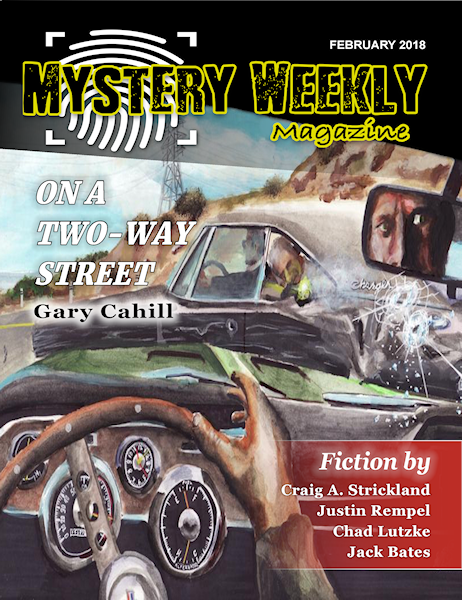 SMFS Member Carlos Orsi has announced to the list that his short story, "The Adventure of the Dead Frog" appears in the Mystery Weekly Magazine: January 2018 issue. 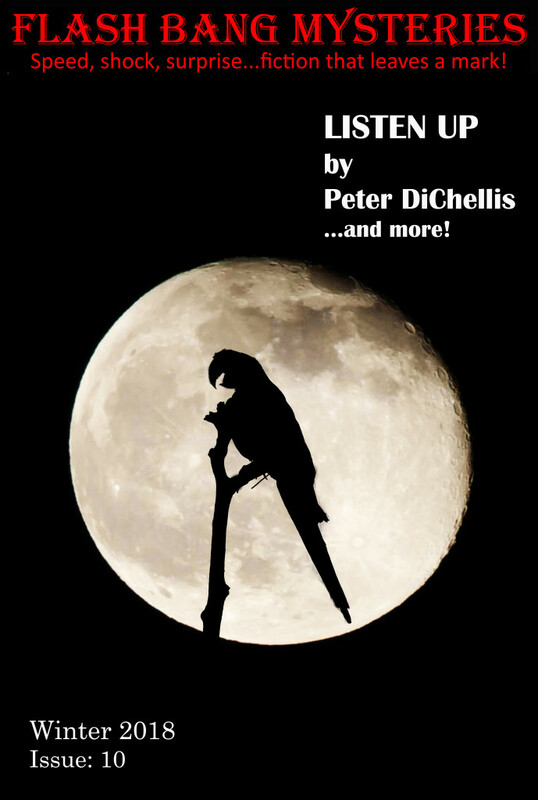 He describes his tale as "a locked-room mystery with a touch of humor." 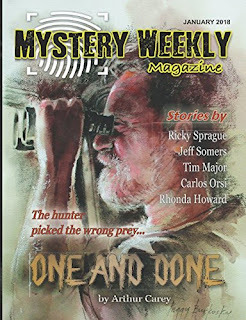 The issue is available at the publisher website, Amazon, and elsewhere. SMFS member Gail Farrelly announced to the list that her four part serial, "The Times Square Terrorist" recently appeared at the Yonkers Tribune starting on December 24rth with Part One. Part Two appeared on December 27, 2017. Part Three appeared on December 29, 2017. The concluding Part Four appeared on December 31, 2017.